Barix has appointed DMJ Technologies as its manufacturer’s representative for the eastern and central U.S. The company will represent Barix out of its New Jersey headquarters and satellite offices in Kansas, New York, Ohio, and Virginia. DMJ Technologies specializes in visual communications, with a strong emphasis on digital signage and IP technologies — two key Barix focus areas. Barix will play a major role across its education, corporate, medical, government, and entertainment projects, all of which benefit from the cost-efficiency and flexibility of IP audio solutions. Specifically, Scoppa views Barix's Audio Point solution as an especially attractive opportunity to align Barix products with existing video signage systems in their portfolio. The Barix Audio Point solution synchronized multichannel audio feeds with content on video displays, and streams that audio to the mobile devices of consumers inside businesses, campuses, and public spaces. Scoppa also sees opportunities to integrate Barix’s IP-based paging and intercom solutions – notably its new simple paging system – alongside video systems in transit centers and across educational and corporate campuses. 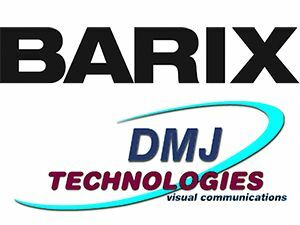 Barix and DMJ Technologies will officially introduce their partnership at the upcoming InfoComm show, taking place June 18-20 at the Las Vegas Convention Center. DMJ representatives will be at the Barix booth (C9420) to discuss the new partnership with dealers, systems integrators and end users. Ronni Guggenheim, CEO of Barix, believes that DMJ Technologies’ experience in helping its customers architect IP-based systems well-positions them to effectively communicate the new opportunities that an enhanced audio presence can provide, especially in digital out-of-home deployments.